This hummus is delicious topped with toasted pine nuts. If you are a heat hound, add cayenne pepper to the mix for some kick. And while the yogurt lends a smoothing element to the hummus, make it vegan by leaving the yogurt out and add about 1/4 cup of water instead. Place the lemon juice, yogurt, olive oil, garlic, tahini and chickpeas in a blender (the liquid is at the base of the blender). Blend on high, stopping to stir frequently, until the hummus is smooth, adding 1-2 tablespoons lukewarm water. Taste, and season with salt. More yogurt and olive oil can be added as desired, to smooth out the hummus. 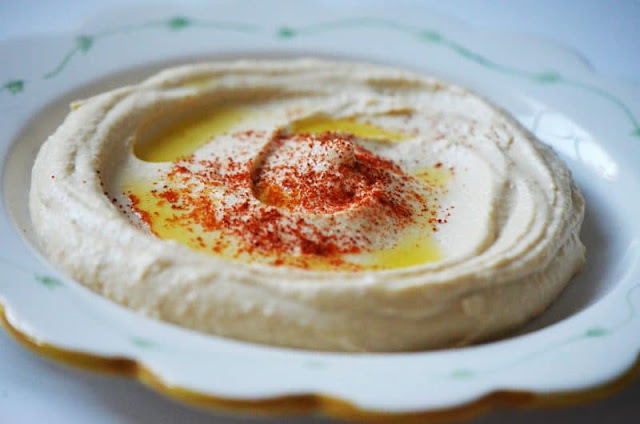 Spread the hummus on a medium-sized plate, drizzle with olive oil and sprinkle with paprika.